June 4, 2010 - USS Ronald Reagan (CVN 76) and embarked Carrier Air Wing (CVW) 14 Sailors departed Naval Air Station North Island (NASNI) in San Diego June 2 to get underway to conduct carrier flight deck certification. The first CVW 14 aircraft to land on Ronald Reagan's flight deck were the "Black Knights" of Helicopter Anti-Submarine Squadron 4. Other embarked squadrons include the "Blue Diamonds" of Strike Fighter Squadron (VFA) 146, the "Argonauts" of VFA 147, the "Black Knights" of VFA 154, the "Black Eagles" of Airborne Early Warning Squadron (VAW) 113 and the "Providers" of Fleet Logistics Squadron (VRC) 30. The squadrons' arrival marked the first flight operation since Ronald Reagan returned to NASNI following its 2009 deployment in support of Operation Enduring Freedom. "It's good to walk before you run," said Aviation Boatswain's Mate (Handling) 1st Class Daniel Estrada, a member of Ronald Reagan's flight deck crew. "We haven't had any aircraft on board since the October (2009) time frame. In order to get through flight deck certifications, we have to get back into the swing of things. This certification allows us to get back to the basics and get our minds set right for sea." As part of the ship's final assessment for carrier qualifications, flight deck certifications are required for the ship to deploy. Evaluators from Naval Air Forces Pacific came aboard to review and evaluate the ship's ability to perform flight operations safely. The review includes tests on the arresting gear systems used for aircraft recovery as well as catapult systems that launch aircraft. The certification will include a full evaluation of the arresting gear, catapults and flight deck personnel. Ronald Reagan's air department Sailors will be assessed on their ability to maintain a fully operational flight deck and respond to simulated mishaps. Experience is the key to success, said Lt. David Martinez, Ronald Reagan's flight deck officer. The challenge for Ronald Reagan is to successfully incorporate more than 250 new Sailors into the air department who were not aboard the last time aircraft were launched from the ship's flight deck. "We're always prepared for success; we're true professionals," said Lt. David Martinez. "We have a core group of seasoned veterans. 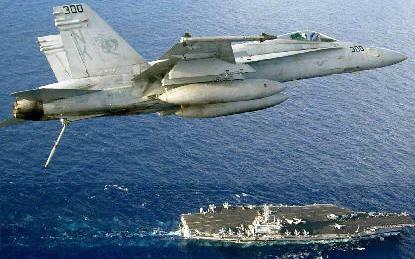 We've added more experience to our team; even our new guys came from USS Nimitz (CVN 68) and USS Kitty Hawk (CVN 63). So we think our team is even stronger." Upon completion of the certification, Ronald Reagan and other 3rd Fleet ships will participate in the International Canadian Fleet Review commemorating the 100th birthday of the Canadian Navy in Victoria, British Columbia, Canada.